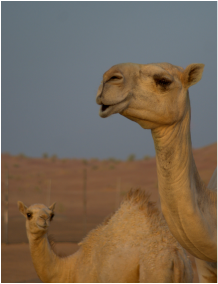 The dromedary (Camelus dromedarius) or Arabian camel has enabled transportation of people and valuable goods over long distances connecting Arabia, the Near East and North Africa. They have been critical in the development of human societies in this geographic region for 3000 years and today remain invaluable in arid and marginal environments supporting millions of people. Advancing desertification and global climate change predictions for the MENA region have prompted interest in the biology and production traits of the species and we now have available the first annotated genome drafts. In an article by Almathen et al. 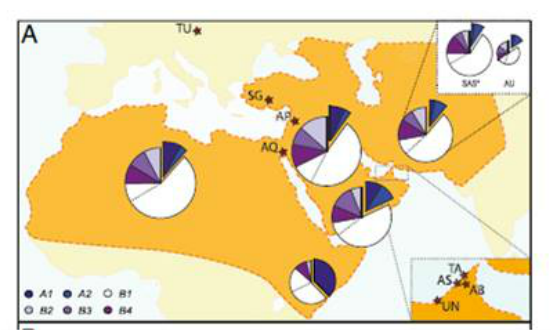 published in PNAS, the history of camel domestication and the influence of ancient trading networks on their genetic structure were studied applying genomic and phylogenic analyses using 759 current mitochondrial and 15 ancient DNA material. Results show how important long-distance and back-and-forth movements in ancient caravan routes shaped the species’ genetic diversity and suggest a history of restocking from wild animals from the southeast coast of the Arabian Peninsula. PNAS figure1 Almathen et al. 2016 Ancient and modern DNA reveal dynamics of domestication and cross-continental dispersal of the dromedary. PNAS 2016 113: 6707-6712.